Nothing quite beats a juicy barbecue chicken sandwich. I love the taste of this succulent meat, dripping with sauces on a huge toasted bun and topped with my favorite coleslaw. Usually, these meals are packed with calories, but there are healthier versions that taste just as good, such as, this Chicken BBQ Sandwich I made for Mike last year on Father’s Day. He couldn’t even tell it was a healthier version and said it was just right after a day on the golf course. 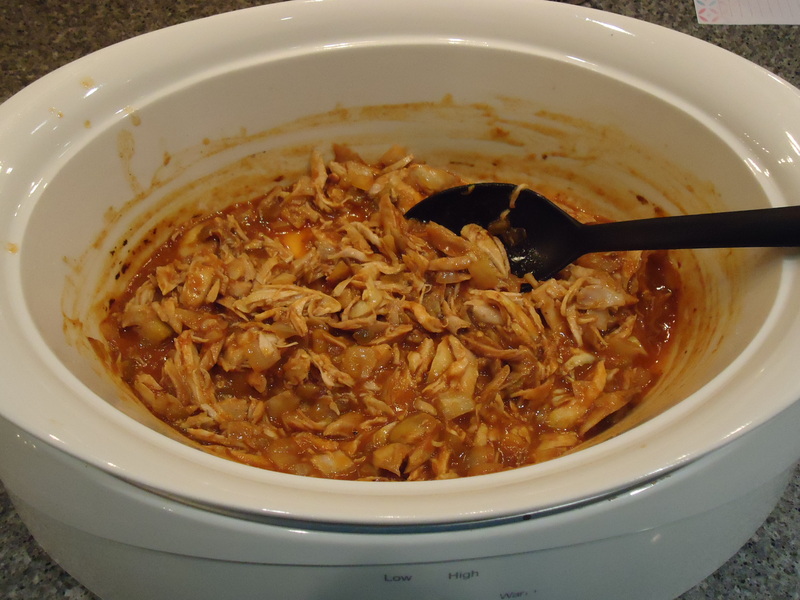 Last week for Crock Pot Wednesday, I wanted to try something different that we would be able to enjoy in the slow cooker throughout the summer. I decided to give an even lighter version of pulled chicken a try and substituted lettuce for the buns. This led to Crock Pot BBQ Pulled Chicken. This meal was amazing and was just what we were craving after a long night of Indoor Golf League. Not only was it delicious, but it was easy and a healthy way to end our evening. This recipe is quite spicy so if you don’t like your food as “hot” cut back on the paprika and use a little black pepper instead of the cayenne pepper. The best part of this meal is you get to smell the delicious aroma of the meat and juices slow cooking all day as you wait to sink your teeth into it. 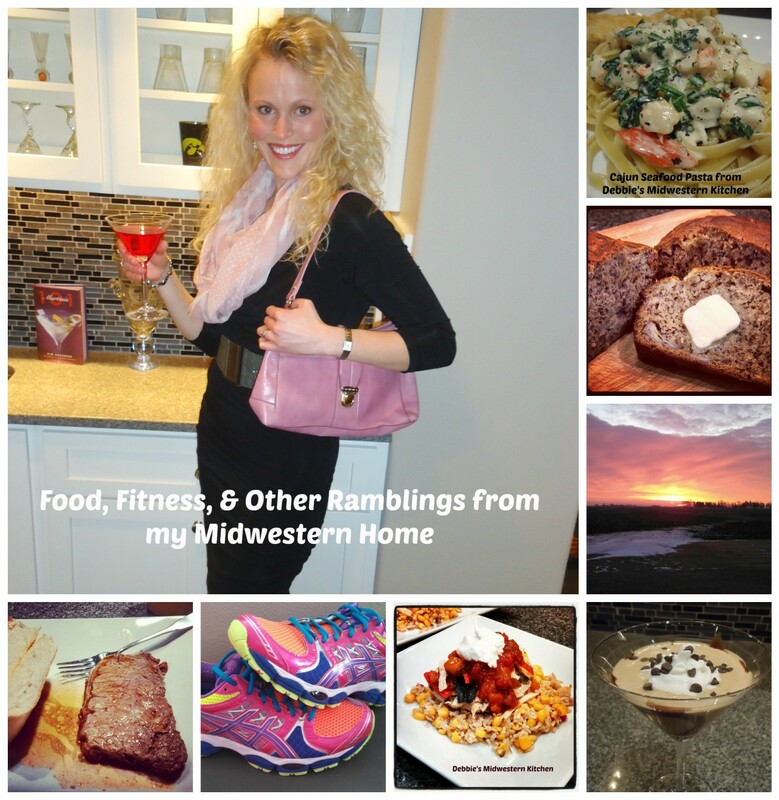 Enjoy without the guilt!!! 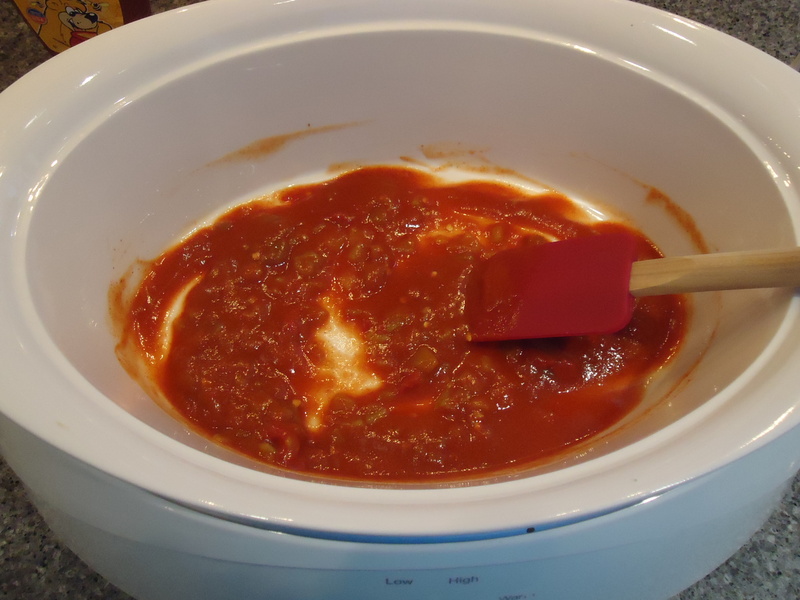 Add tomato sauce, chiles, vinegar, honey, paprika, tomato paste, Worcestershire sauce, mustard, cayenne pepper, and salt to crock pot. Stir to combine until smooth. Add chicken. My grocery store was out of skinless thighs so I just peeled the skin off myself before adding to the crock pot. Pretty simple. Top with onion and garlic. Cook on Low 5-7 hours. 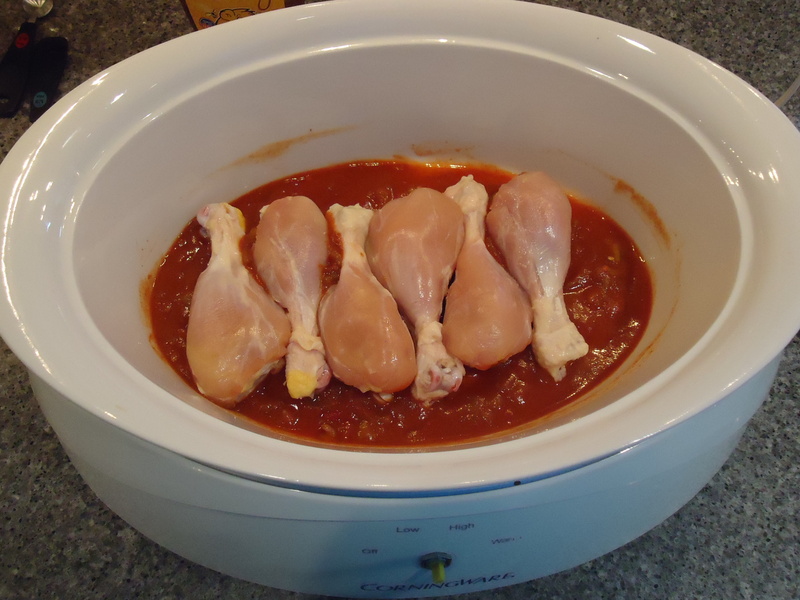 Before serving, take chicken out of crock pot and place on a cutting board. Pull from bone using a fork and shred. It should fall off the bone easily. 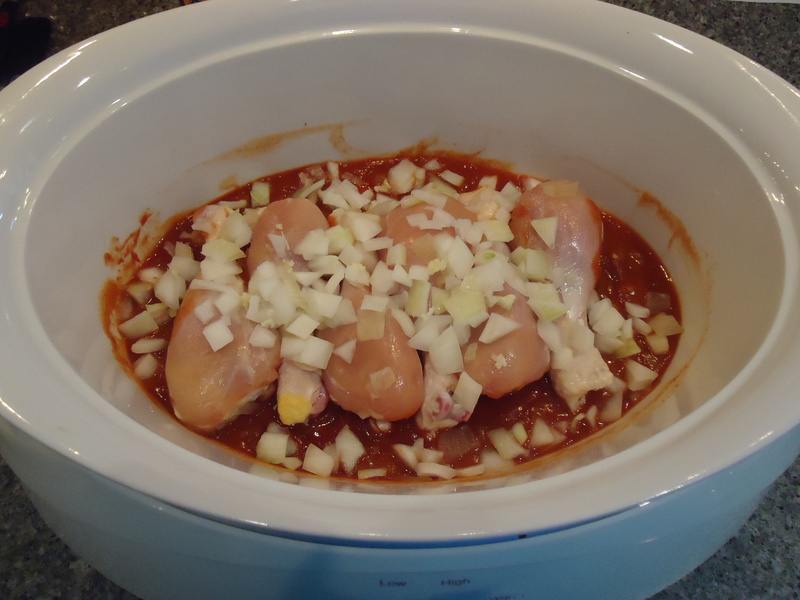 Return to crock pot and stir well to combine meat and sauce. 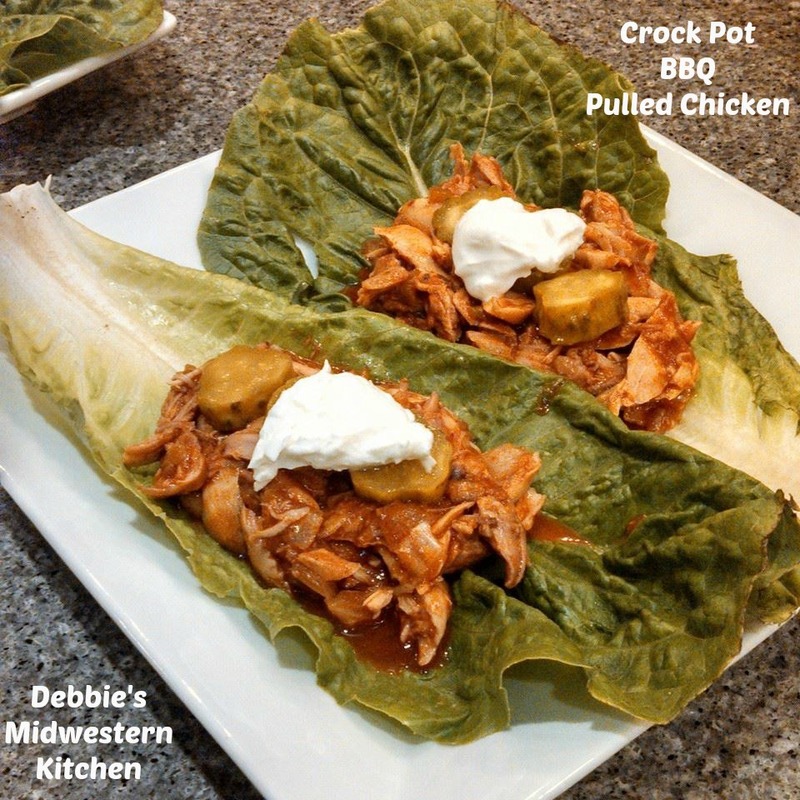 Place large romaine lettuce leaves on serving plates. Fill with meat and top with your favorite toppings. I topped ours with pickles and plain Greek Yogurt, and they were delcious. It would also be great topped with jalapenos, red onions, or coleslaw. Another winner, Debbie!! Looks yummy and I bet it smells amazing all the time it cooks!! !